Positive: Decent hardware; good autonomy; good price. Обзор: BQ Space — что нужно, чтобы стать космосом? Positive: Nice design; decent display. Negative: Relatively high price. Model: With Android manufacturers constantly pumping out new devices it isn’t surprising to hear of unknown brands. One of them being BQ with their BQ-5201 SPACE. It should be noted that not all Android manufacturers will necessarily aim for the flagship market when most of the sales are actually from the budget or mid-tier markets. So, what are the pros and cons of the BQ-5201 SPACE? 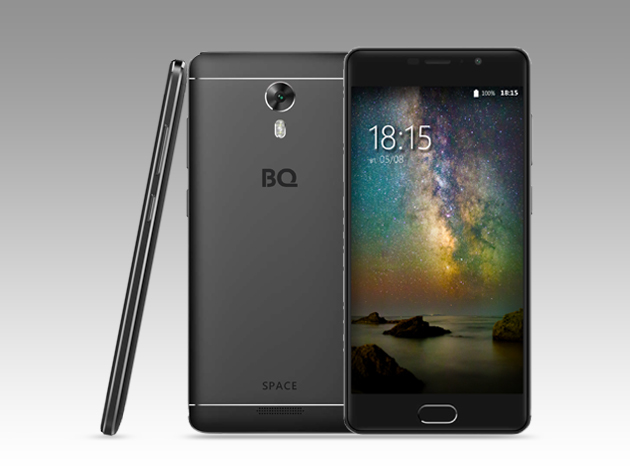 The BQ-5201 SPACE is powered by a Mediatek MT6753 SoC, which is mainly found in Chinese smartphones, 3 GB of RAM, 32 GB of storage and a 5.2-inch 720p IPS screen. Just looking at the rough specs one can see that the BQ-5201 SPACE has more or less targeted the mid-tier market. The chassis of the BQ-5201 SPACE looks pretty much like your average rectangular bar with rounded edges but it has some flair to its design. The BQ-5201 SPACE uses a mix of both plastic and metal, which is about right for the market segment. The included IPS LCD display has a HD resolution. This may not be impressive but is more than sufficient for a pleasant viewing experience. The display remains reasonably bright with colors looking natural and vibrant even if looked at closely. The BQ-5201 SPACE touch screen remains quite accurate when typing text and is able to support up to 5 simultaneous touches. As for software and interfaces the BQ-5201 SPACE is pretty much as stock as in can get with Android 7.0 Nougat pre-installed. Bloatware remains inexistent, which is good since it can slow down this device significantly. Despite being marketed as a mid-tier device with its current specs it feels flagship-like since the novelty here is its 8-core processor. Obviously as a smartphone one should also talk about its camera, the BQ-5201 SPACE has a 13 MP front camera and a 16 MP rear camera installed. However, its flash is somewhat lacking since most mid-tier phones these days have a dual tone flash, which can help with picture quality. Nonetheless the picture quality is satisfactory, yet not impressive. One notable point about this phone is its reasonably large 4000 mAh battery, which is plenty to get by in a day without charging even on heavy use. It is quite interesting that, even though not many companies compete on the Android flagship segment, it is always nice to see what offerings are there lower down in the stack. The BQ-5201 SPACE seems well designed for its market segment with flagship like specs.